With Christmas rapidly approaching we have not really watched as many Christmas movies as we would like. Mostly we've watched The Grinch and Rudolph repeatedly. 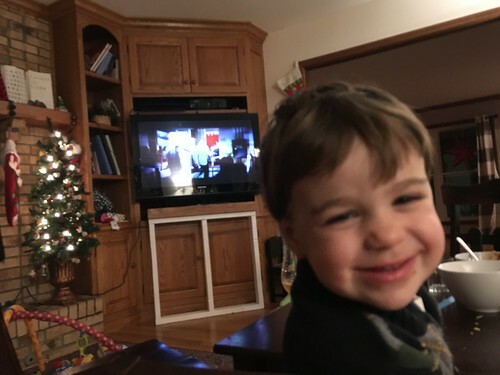 Added this year is a movie that Elliott improperly called Thomas's Winter Merry Wish which is watchable and The Cat in the Hat Knows a Lot About Christmas which is not our favorite. The boys love them so what can you say? Lately one way to entertain Josephine has been putting her on top of the piano while I play. 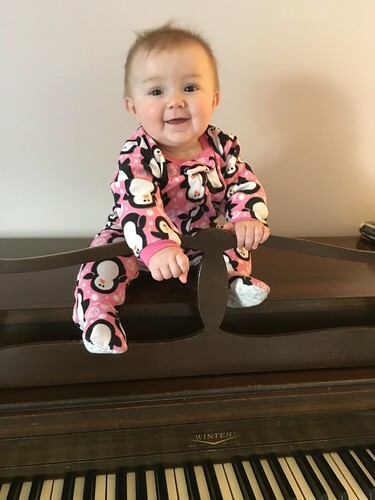 It's just a little dangerous so more often I put her in her high chair or Boppy beside the piano. This works better when her brothers aren't around to tackle her with hugs. 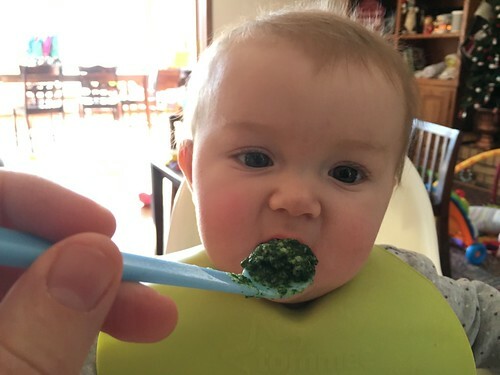 Josephine had her first spinach. 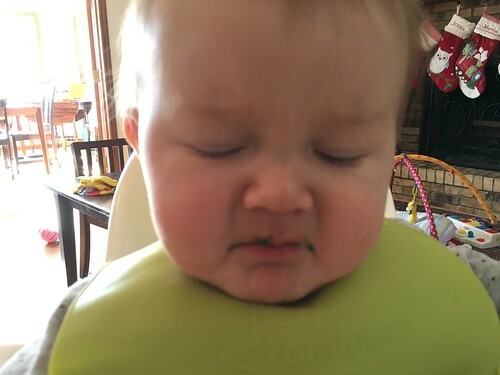 She did not love it. She may also not love us anymore after our deep betrayal. The boys liked White Christmas far more than I would have guessed. 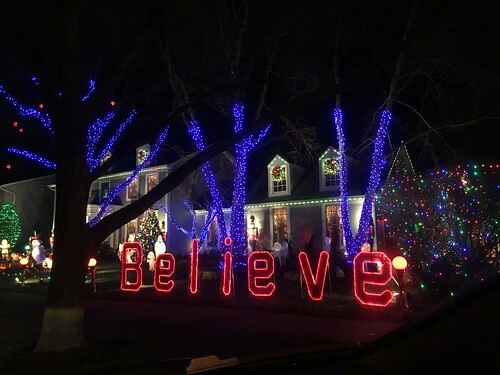 I didn't think it would be a huge hit since it essentially has nothing to do with anything Christmas related other than the first five minute and the last five minutes. Elliott particularly enjoyed the first dance number with Danny Kaye and Vera-Ellen. That is when he turned to me and famously said, "If he got cheese on his wonderful clothes I would eat it off." This is the highest form of praise that anyone has ever laid at the feet of Danny Kaye. 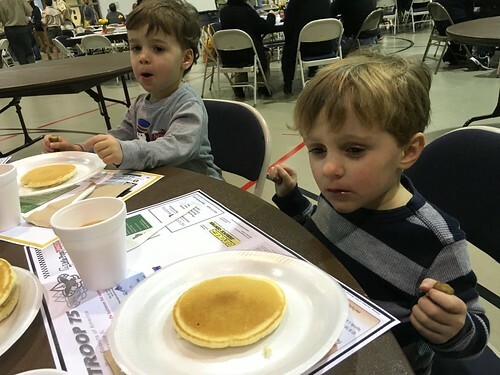 We got tickets for a Boy Scout pancake breakfast which we attended and reminded me of the Boy Scout pancake breakfasts of yesteryear. This is the first time I've been on the other end of the breakfast, being served by awkward tweens who were exceptionally polite. The boys ate about fifteen sausage links each. We took the boys on a Christmas light tour in their pajamas while drinking hot chocolate. It started off very promising but Elliott was in a weird mood where he wouldn't talk to us then he started whining on the way home and not explaining what was the matter. Then he had an all out tantrum and screamed for about 45 minutes. When they were finally in their room I told them we could look at pictures of the lights we saw. When we got to the above picture Elliott said, "That was my favorite. I didn't want to leave." I asked if that's why he was upset and he whimpered, "Yes." I then explained to him that telling us he wanted to stay a little easier would have made for a much more enjoyable 90 minutes for all of us. 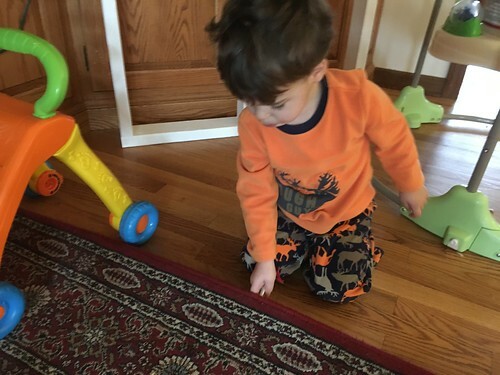 It was both the saddest and most frustrating parenting moment of 2015. 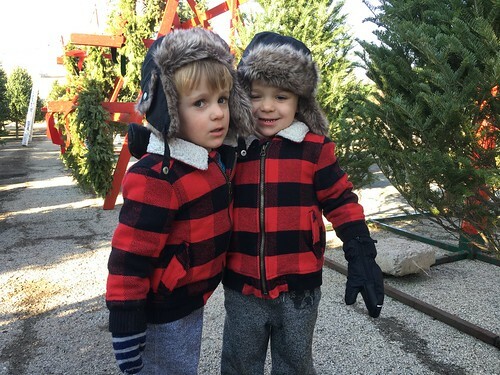 We went out in search of a Christmas tree and the boys had a blast running in and out of the maze and mostly avoiding being hit by any cars after reminders to not go out into the parking lot. 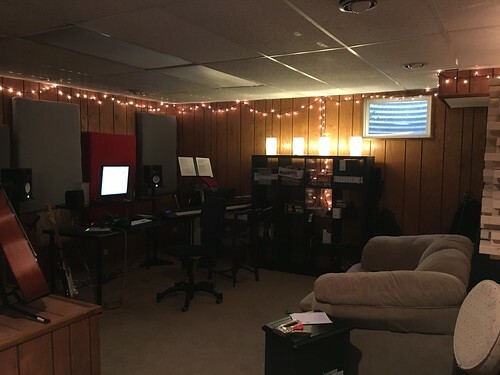 I set up some festive Christmas lighting in the studio and we had some real fun playing down there, mostly Batman and Robin, the boys' favorite game where I am Batman, Elliott is also Batman, and Martin is Robin. Then there are bad guys and we have to get them and put them in jail. Martin is a little obsessed with being Robin. This is concerning because no one should want> to be Robin. We had an unexpected visit from Uncle Adam and there was a wild wrestling-filled evening before getting the boys to bed. 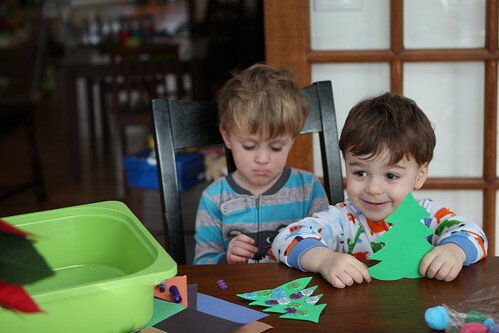 Jen has attempted many Christmas crafts with the boys in an attempt to send letters to family and Santa. I think she's probably put about 40 solid hours of work into generating maybe eight letters total. 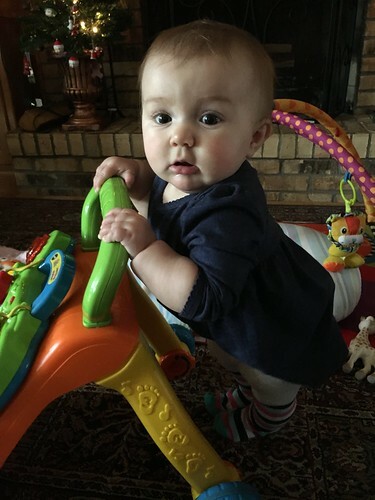 Josie can almost stand using her Learning Farm which is a huge milestone for her. Unfortunately she has also hit a milestone of fussing and whining all the time whenever her most favorite person in the world (Mummy) walks more than two feet away from her. 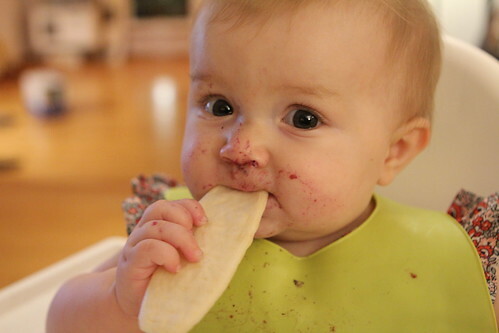 She does the same to me but only when Mummy is not around. Jen is first class. Grandma is fourth class. I'm fifth class. And everyone else is solidly around ninetieth class. 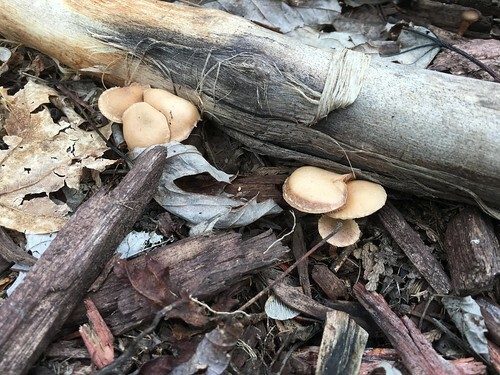 It's been exceptionally warm with temperatures in the 60s such that we've played out in the yard several times without even needing any jackets. 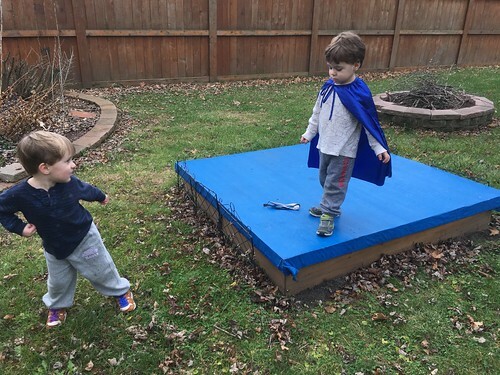 All the toys are put away for winter so mostly they've had to improvise being superheros and building fences around the sand box. The weather has brought many mushrooms to sprout form the lawn, this one in particular caught Elliott's interest enough to attempt to eat it. 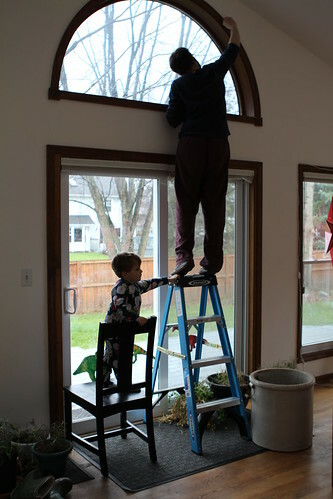 This left me calling poison control and being pretty sure that he was going to be okay. I also continued my insane crusade to decorate our house with excessive amounts of lights for Christmas. My goal is to not need to use our horrible overhead lights for Christmas dinner. 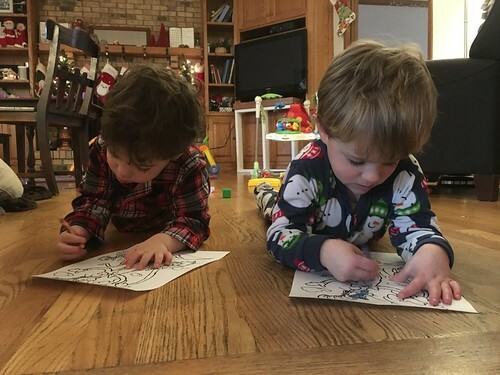 The boys have been extremely interested in coloring recently. I've been printing pages and pages of pictures for them on a daily basis. They are both extremely specific and very selective about exactly what it is that they color. Usually the selection process takes about 15-20 minutes and the coloring process lasts about 5-10. 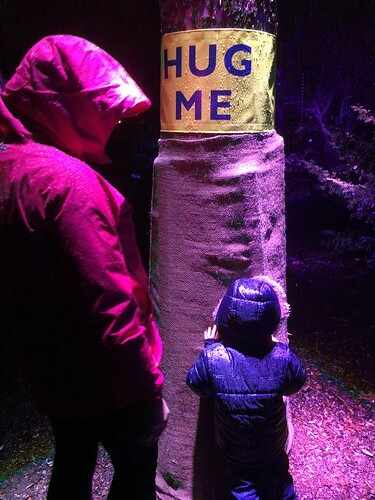 We took them to the Arboretum on a rainy night to see the beautiful lights and this ended up being a huge fiasco. 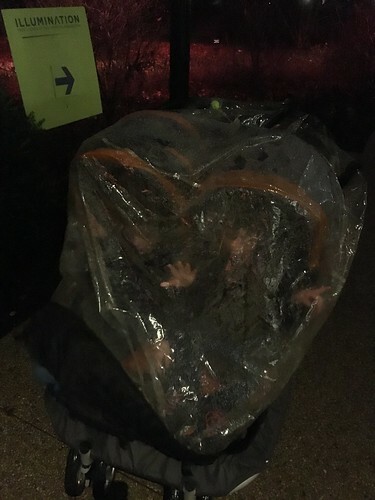 While it was beautiful everyone was soaked and Josephine began freaking out. Martin passed out on the way back as I sprinted in time trial position back to the cafe and seating area where a very good band was warming out to play songs. 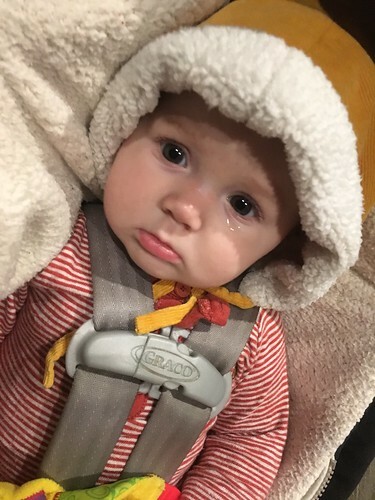 Josephine's carrier was soaked and she uttered her first words, "Do not ever take me here again, Daddy." 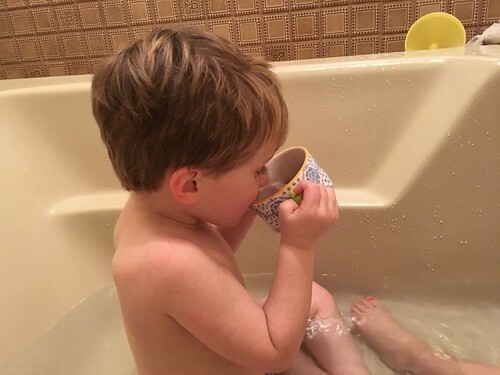 After getting everyone home and out of their wet clothes I made a pot of hot cocoa for them to drink while in the tub. Elliott, of course, spilled his hot cocoa in the tub which meant we needed to drain it and hop in the shower. 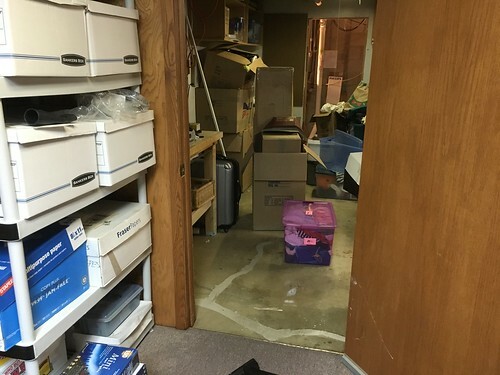 This week started with the unthinkable: a basement flood. Our carpet was completely destroyed and, of course, nothing was covered by insurance. 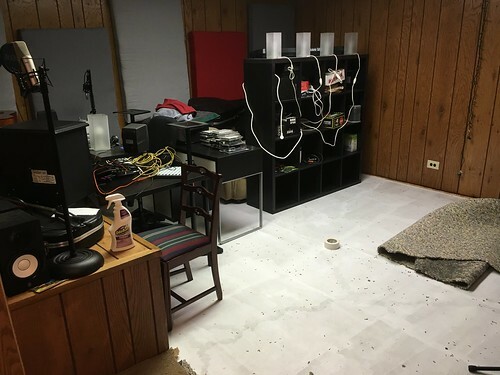 This left our basement in need of four days of drying and the days of music and playing Batman have come to a close until we can get it carpeted again. 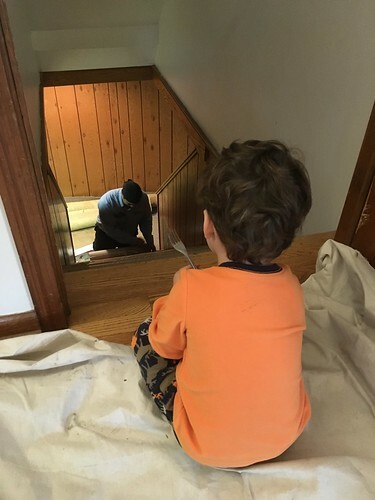 Elliott was obsessed with the men who were working hard to save our basement from a huge mold growth. He was so obsessed that he grabbed a fork Christmas decoration and began pulling up the throw rug in our living room. 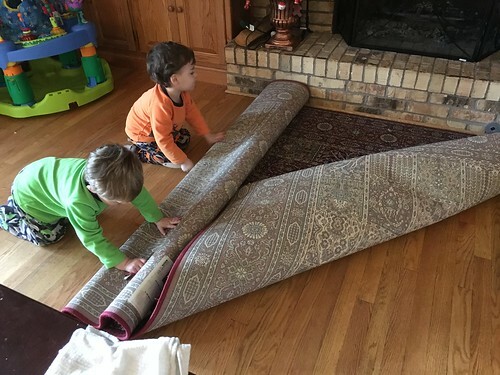 The two of them spent the afternoon rolling up our perfectly good carpet to dispose of it. 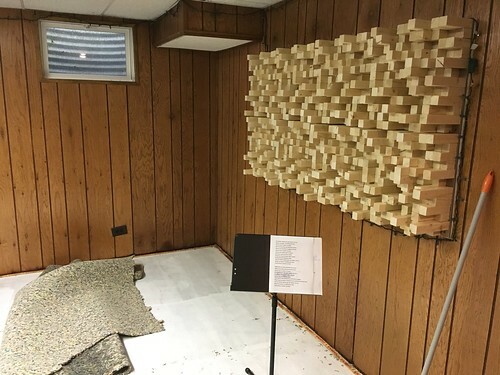 One day we'll be able to rebuild, I hope, as I have spent the little free time I have over the past two years to get the recording studio to a place where it was functional. With a concrete floor and tacks sticking out of the ground there isn't much I can do down there, especially without the boys. 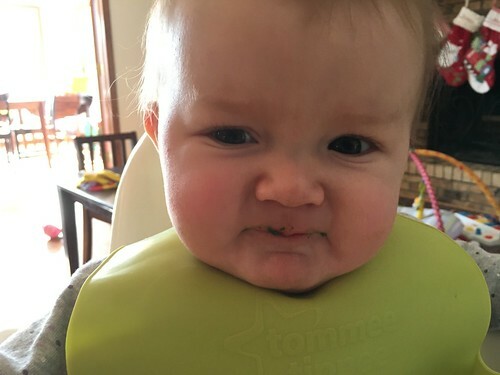 Josephine discovered the glory of Mum-Mums and has been downing several a day. I think she is relieved that we finally seem to be getting the hint that she wants actualy, real food. 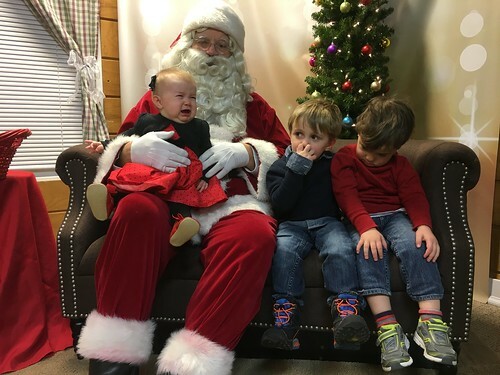 We took the boys to see Santa downtown. Martin was delighted and chatted him up. Elliott was extremely shy and didn't want to say anything. Josephine was fine with Santa until she remembered that she was starving and lost her mind. Overall it went better than we expected. 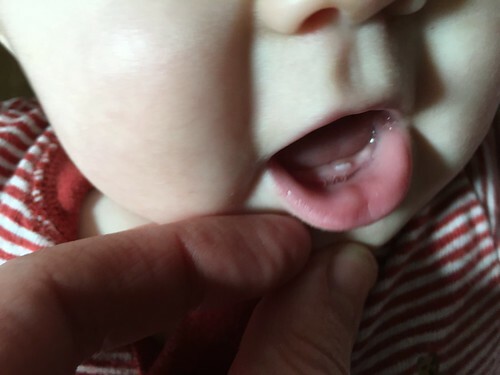 Josephine has gotten her first tooth and is happy to bite your finger at any point to remind you of this. 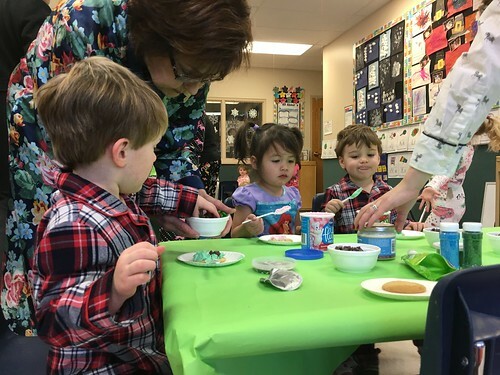 The boys had a school pajama party in which the parents were all told to wear their pajamas as well. 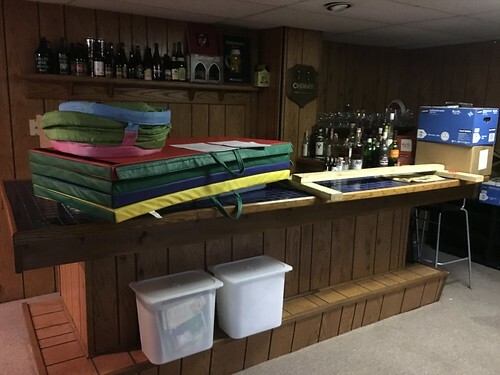 Jen and I were about 50% of the total parents who actually did this so we spent most of the time sitting on the floor feeling extremely awkward and avoiding eye contact with the other parents. My parents arrived on Friday and were volunteered to watch the children as Jen and I left to go see the new Star Wars movie. Of course we didn't tell the boys why we were leaving. I can only imagine how pissed they'd be if they knew we were going to the movies, and to watch Star Wars without them nonetheless. Some day they may read this and learn of this great betrayal. 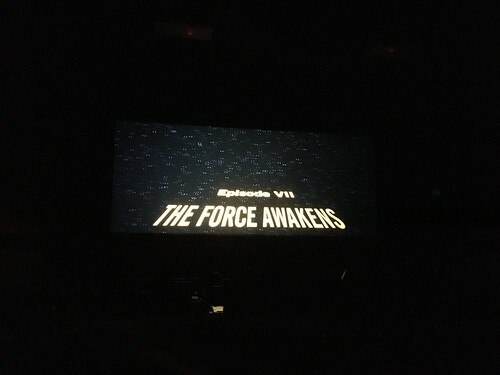 I can only respond by saying this was Daddy's first movie since 2011, before they were born. 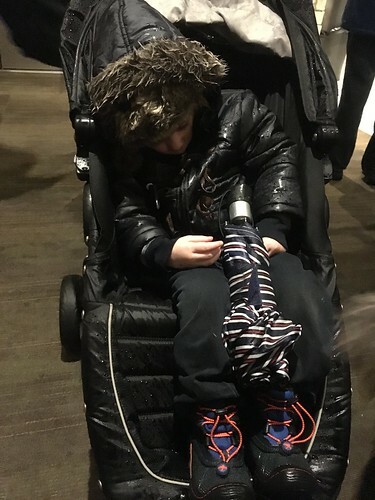 Also, it was a little too much for three-and-a-half year olds. Also, I will watch any of the original movies with you at any time! I also preferred being Robin. Not a surprise? You were always the sidekick.